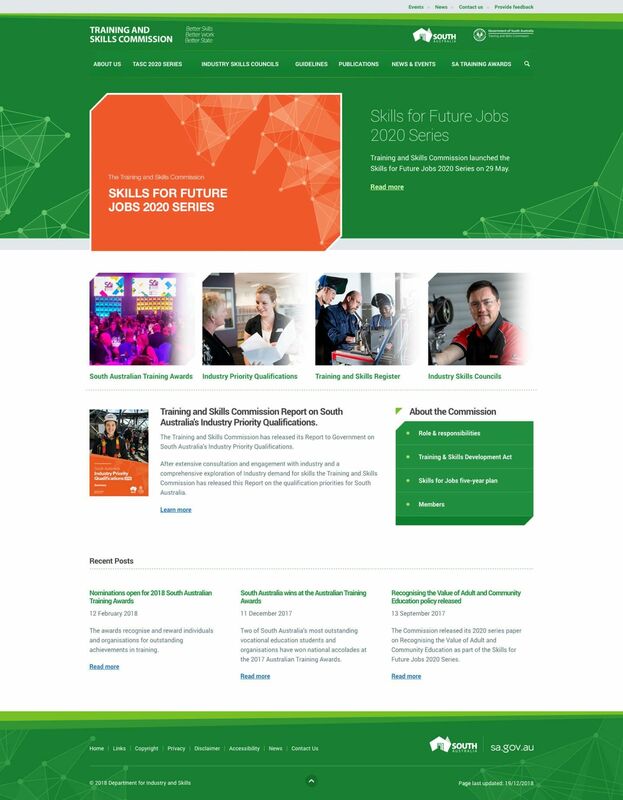 The Training and Skills Commission (TASC) provides independent, strategic advice on how South Australia can invest in a sustainable and highly skilled workforce, particularly in key growth sectors. As a prequalified ICT supplier on the South Australian Government eProjects Panel and current trusted provider to the Department of State Development, The Digital Embassy was approached for the redevelopment of the TASC website and provided ongoing maintenance, upgrades and training. 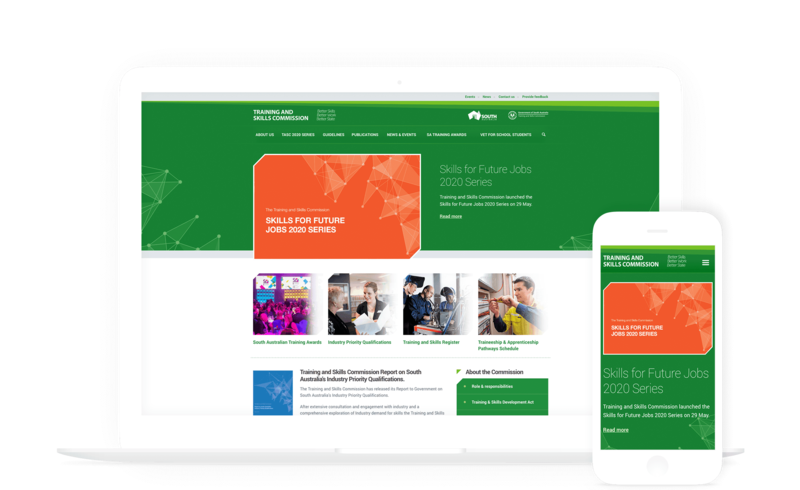 The Training and Skills Commission required their DNN, ASP.NET powered website to be upgraded in terms of the platform version, and to be redeveloped to be mobile responsive and meet the SA Government Website Standards for accessibility (WCAG 2.0AA). 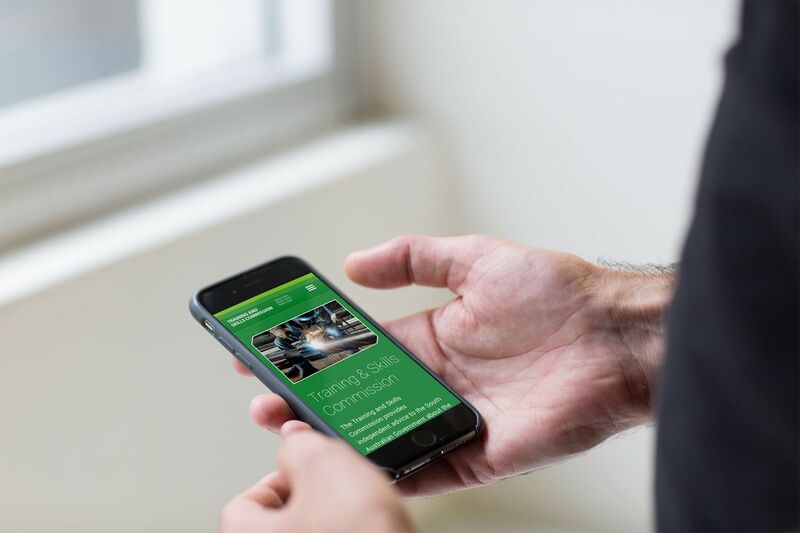 The previous website was limited in functionality and proved difficult to use and navigate for industry, registered training organisations, and other stakeholders including those that may be visually impaired. TASC required a solution that would direct users to quickly locate key resource information on Industry Reports, Training and Skills Register, Changes to the Act, Traineeships and Apprentice Pathways and Training Awards. Website administrators at TASC were seeking improved and simplified publishing ability, a Password Protected members-only section for Commission Members, site functioning without the use of style sheets, including implementation of relative heights and font sizes without breaking page-layouts. As part of the development process, The Digital Embassy reviewed and redesigned new information architecture through the use of site-mapping and wireframes. Our creative team developed website interface concepts for the new TASC website and provided direction for the site structure to deliver the desired user experience appropriate to the TASC website’s multiple target audiences. Upon the approval of wireframe concepts and visual design work, the development phase commenced with visual concepts integrated into an upgraded version of the DNN CMS platform templates. A standards compliant (XHTML & CSS) website structure was created and developed by The Digital Embassy in-house development team. Navigation systems and user interface elements where developed based on the enhanced information architecture. Password Protected Members Area; A section of the website dedicated to registered members of the website. A user group will be established with privileges enabling them to access the member’s area once logged in. TASC website administrators are able to add new users to this user group and distribute access details. Meta Data Manager; Implemented for compliance with State Government Website Standards this module enables AGLS metadata to be inserted into each page. This module was custom developed in conjunction with the department. Site Map; The Digital Embassy’s own propriety DNN sitemap module is used to provide a flexible sitemap that can be viewed in hierarchical or alphabetical listing. 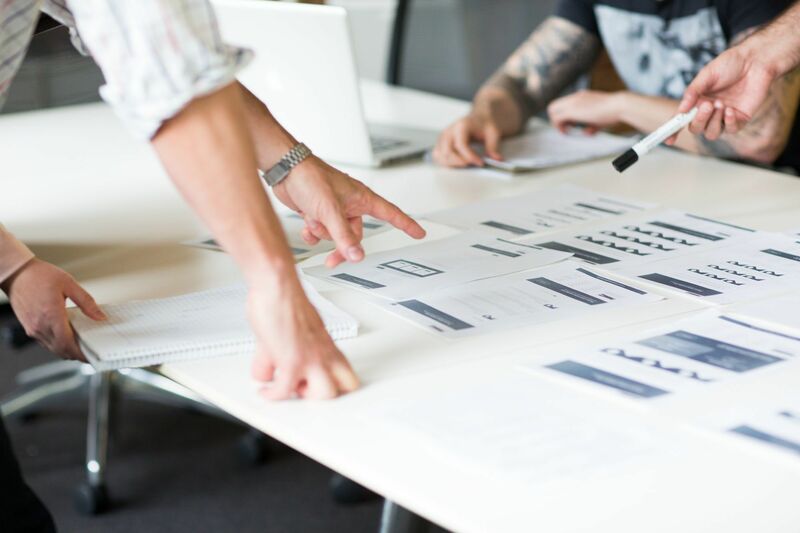 During the design phase, the accessibility guidelines were reviewed to ensure that design elements introduced as part of the project will fit within the requirement parameters. Where changes were required, the design team were consulted so adjustments could be made. During development, WCGA guidelines are continually referenced throughout the build process. As each skin item (template) was completed, it was tested manually and with third party tools including WAVE and Web Accessibility Inspector. These tools provide reports on errors, warnings, and suggestions so that changes could be implemented throughout the development cycle. Post the development phase, tests were performed in the context of a completed site. Mock accessibility tests were conducted to replicate the website experience if the user had images disabled, styles disabled, text magnified etc. The purpose of these tests was to evaluate accessibility for people using assistive technologies such as screen readers. User Acceptance Testing: Handover of completed project while within the staging environment for client review. Feedback is gathered by way of an Issues Register and rectified through a two-stage process of review and remediation. Deployment: Upon final acceptance a deployment plan was put into action to promote the completed project from development/testing to intended production environment. The Training and Skills Commission website project was able to meet all project requirements in terms of design, user experience, accessibility, ease of editor publishing functionality, and the successful update of the DNN ASP.NET CMS platform. Publisher training was provided for up to 6 attendees with ongoing maintenance and ad-hoc support provisioned as need. The website project was delivered on time and within budget, benefiting greatly from having a clearly defined scope. This assisted with achieving all specification and deliverable requirements, while facilitating strong stakeholder engagement throughout the project. Upon the conclusion of the project TASC reported that The Digital Embassy had been easy to work with and exceeded their expectations.